Each year judges all across the United States make millions of decisions about whether criminal defendants should be released or detained in jail as they await final adjudication of their cases. While these predictions are currently made by judges mentally processing information about past cases, the growing digitization of case records raises the possibility of using new techniques from machine learning instead. In this talk, I will present our research on building machine learning algorithms which can complement human decision making in decision critical settings such as judiciary. The release rules guided by predictions of these machine learning algorithms result in lower failure rates among released defendants compared to release decisions of judges. Furthermore, I will also discuss how machine learning can provide us with diagnostic insights into the patterns of mistakes made by judges. Lastly, I will provide an overview of some of our recent research which involves developing interpretable machine learning models which can be used to explain patterns of defendant behavior to judges. Himabindu Lakkaraju is a PhD student in Computer Science at Stanford University. Her research focuses on building machine learning algorithms which can complement human decision making in domains such as judiciary, health care and education. Some of her notable research involved developing prediction models which can help judges with bail decisions. She also developed a series of machine learning models which can provide diagnostic insights into the patterns of mistakes made during the process of decision making. More recently, she has been focusing on building interpretable prediction models which not only optimize for predictive power but also emphasize on explaining how the algorithm is making those predictions. Such models allow domain experts to validate the prediction logic which in turn increases their confidence in the efficacy of the model thus bridging the gap between machine learning and its application to critical decision making. Her research is being supported by a Robert Bosch Stanford Graduate Fellowship and a Google Anita Borg Scholarship. 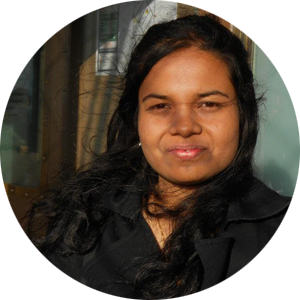 Prior to joining Stanford, Himabindu was a technical staff member at IBM Research where she worked on natural language processing and sentiment analysis. Her research has been published in several top data mining conferences such as KDD, ICDM, SDM, CIKM etc. Her research contributions were recognized with numerous awards including a best paper award at SIAM International Conference on Data Mining and IBM eminence and excellence award.